Beautiful Montana Log Cabin Home with Perfect Views of the Mountains! Spacious Montana Log Home with amazing views of the mountain. Just a 15 minute drive away is Whitefish Mountain which is one of Montana’s finest ski resorts. Whitefish Resort links you to 3000 acres (98 trails) where you can enjoy some world class skiing. The resort is well known for a pleasant lack of lift lines as for its consistently good snow conditions, on average 300 inches a year! When the snow melts, Whitefish Mountain Resort becomes home to thrilling zip lines and an alpine slide, world-class downhill and cross-country mountain biking, and the unique Walk in the Treetops, in addition to spectacular hiking, golfing, water sports, fly fishing, whitewater rafting and Glacier National Park, it is the perfect base camp for a summer visit to Montana’s majestic Flathead Valley. This home is just a 7 minute drive away from historic Downtown Whitefish. If you enjoy shopping, this is the place for you! There are many Clothing, Souvenir and Antique shops for you to relish in. Take pleasure in some of the finest restaurants that the Flathead Valley has to offer! 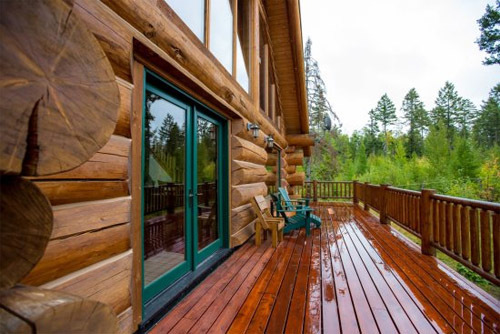 This gorgeous Montana log home has 3000 square feet of living space packed with all the comforts of home. This home has large windows for ample light and spectacular views plus there is no extra charge for the fresh mountain air. The floor plan is open and inviting. Spacious kitchen with stainless steel appliances and large dining room table. Cozy living room with a wood stove. On the upper level is a beautiful Master Bedroom which has queen-size bed, private bath and large closet. Outside of the master suite is a small loft which has one twin size bed for additional sleeping. There is one large bedroom on the main level with a king size bed and large on suite bathroom. The main level also has another full bathroom with a gorgeous claw foot bath tub. On the lower level are two guest rooms each with one set of bunk beds. There is a beautiful full bathroom in the hall with a full washer and dryer as well. The lower level of the home features a cozy TV area with a sofa’s, mini fridge and table area. Enjoy the beautiful views off the deck of the home! You owe it to yourself to stay in this beautiful Whitefish home! Enter your Dates and CLICK "GET QUOTE" to Book Today and receive your Discount! Please feel free to call Paul if you have any questions! Tiffany was very responsive to all our questions/needs and took care of us completely. The location was beautiful, hot tub wonderful and everything we needed was there.